Greetings from Disneyland. After a hectic spring in my kitchen, I was happy to trade my whisk for a wand and a little pixie dust and some California sunshine. This is my first foray to Neverland with the youngest set in tow. I remember my first trip here, riding through miles and miles of orange groves in our oversized (and often over-heated) lilac tone Cadillac. It seemed liked forever until we spotted the iconic Matterhorn, parked the car and rode the train to the entrance gate. My mother proudly announced to anyone who would listen that I was born the same year which Disneyland opened. I was always slightly annoyed and very disappointed that the magical birth year I shared with Disneyland provided no perks whatsoever. Twenty some years later, with my own young children in tow, I again made the trip to this great fantasyland. The orange groves had disappeared, but there were still acres and acres of strawberries covering the ground on either side of the freeway as we made our way to the familiar entrance. On and off over the next fifteen years, whenever I had a business trip to the area, I’d bring along a kid or two and we’d make a quick one-day outing through the Magic Kingdom. Once, on a trip to Los Angeles to buy wholesale party supplies for a client, I brought along my daughters to purchase some items for Ryanne’s wedding. I envisioned a memorable day in elegant shops, hand selecting little take-away gifts for the reception. Instead, in her only “bride moment,” Ryanne wailed, “I don’t want to shop for my wedding. I don’t want a veil. I want to go to Disneyland.” And so, we did. Now some 50 odd years after my first trip, I find myself dusting off my mouse ears to help usher in the next generation—this time three of my grandchildren—to the park. With their parents busy planning which days we would lounge by the pool and which rides were worth the wait, I was free to plan our dining reservations and travel snacks. Ryanne tried to comment on the number of suitcases I had (more than their family of five), but I was quick to point out that one of mine was filled entirely with travel nibbles for them. No Pilgeram family trip is complete without a jaunt to Costco to load up on snacks—I like a nice combination of savory (nuts and crackers) and sweets (including fruit snacks and chocolate covered anything), and of course a bottle of good vodka. Even in my casual snack world, presentation is everything. Though she rolled her eyes when I whipped out my Minnie Mouse snack containers on the airplane, Ryanne dared not complain because those preschoolers didn’t make a peep the entire flight. As soon as we arrived, I could turn my attention to our club concierge and Disneyland dining confirmations. My favorite place to eat is the Blue Bayou overlooking the Pirates of the Caribbean ride—it’s dark and cool with twinkling Delta fireflies. I am drawn there every time I visit the park. Since my first meal there about forty years ago, not much about the Blue Bayou has changed, and that’s the appeal. And I still can’t wait to savor their legendary Monte Cristo Sandwich, which has been on the menu since 1967. Reservations are hard to come by, so be sure to reserve up to 60 days in advance. Disneyland is all grown up now (and so are the entrance fees) and the food seems to have become an even more important revenue stream for the park. A line snaked out the door of the Candy Palace, where young and old alike waited to order a variety of Mickey Mouse caramel or chocolate dipped apples for fifteen bucks. Specialty restaurants that require reservations have sprung up in all the parks, along with food and culinary shops dedicated to making Disney themed food masterpieces. Though I managed to raise my children without a Micky Mouse waffle iron, I don’t feel that the grandchildren will have a complete life without this apparatus. And so, long after the bags are put away, we’ll keep making Disney magic (and Monte Cristo Sandwiches) in my kitchen. 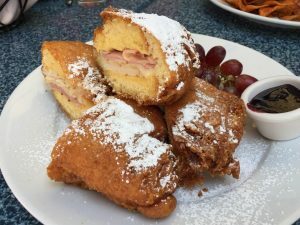 Of all the delectable offerings served at the restaurant during the last four decades, Disneyland states the most popular item by far is the Blue Bayou Monte Cristo Sandwich. It was available on the original 1967 menu and is still available at lunch service today. The sandwich has been so popular over the years, with upwards of 200 of them served a day, that a card was printed up for guests who requested the recipe. Makes four sandwiches. Serve this French-like sandwich a light salad and a chilled white wine.